SPECIAL OFFER - SAVE £200 ON THE NORMAL PRICE AND GET TWO PREMIUM UPGRADE KITS WORTH ANOTHER £259.98 FREE. SEE THIS AMAZING MACHINE IN STORE NOW. The extra large long arm (111/4”, 285mm) gives you more space then ever. 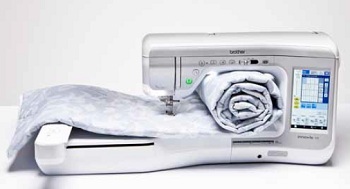 The Innov-is V5 gives a wide expanse of space for those extra-large quilting, fashion, and home décor projects. 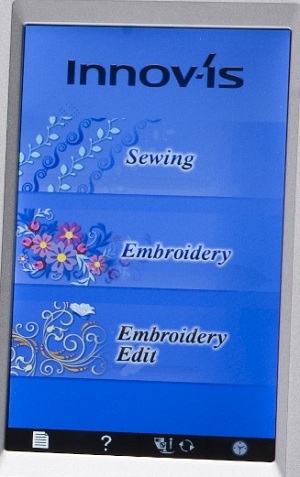 The large, bright, clear, full colour LCD touch screen display offers user-friendly controls to select designs, edit embroidery patterns and adjust stitches. These supportive features make creating projects easy by previewing your designs in the full colour screen where you can also, with the touch of a button, add lettering, rotate, enlarge, reduce and combine easily and quickly. 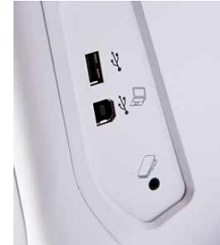 Simply connect to your PC via the USB port, or insert a USB memory stick, to quickly and simply import or export designs. You can store your designs in folders on your memory stick so that they are organised and you can easily find them when needed. 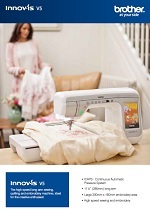 The Innovis V5 quickly navigates through your memory stick and displays your embroidery designs in bright vivid colour. With the optional PE-Design software, you can convert numerous image files into stitch data. The ultra bright LED lighting gives a crisp bright natural light, so you can see colours and stitch details, no matter what your lighting conditions. The lighting brightness is fully adjustable so you can set it at a level to suit you and your environment. With the Eco-mode function, the Innov-is V5 will automatically switch to an energy-saving sleep mode after a period of non-use. 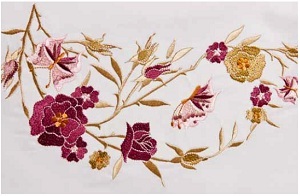 Save valuable time and embroider large intricate designs faster then ever with high speed embroidery of up to 1,050 stitches per minute. 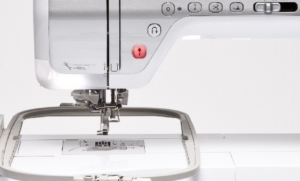 The simple slide-on frame mechanism lets you quickly attach and remove embroidery frames, whilst the automatic thread trimmers instantly cut jump threads to help save you time and effort. The machine includes 227 embroidery designs and 17 embroidery fonts including Classic Japanese, Vintage, Trendy and Zundt™. 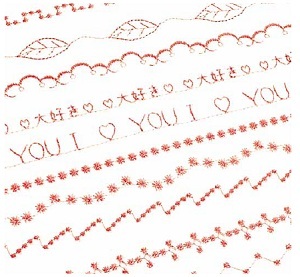 And with Brother's amazing motorised needle threading and embroidery speeds of up to 1,050 stitches per minute you'll whiz through these designs in no time at all. With hundreds of extraordinary new embroidery and stitch designs to choose from, the Innov-is V5 is packed with creativity. From large intricate patterns to simple monogram fonts, it helps you select the right design or stitch for every application. Crazy quilting design: A range of specially designed new crazy quilt stitches are ideal for the avid quilter. These distinctive designs give you a fantastic range of choice perfect for any project. Vintage design: Add beautiful embellishments to your projects with a collection of these vintage inspired patterns. for special projects from christening gowns or wedding dresses to fine table linens. 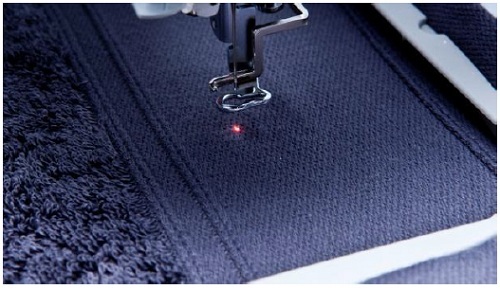 The optional new LED pointer embroidery foot enables perfect needle placement for embroidery. The LED pointer shows clearly where the needle will drop, making adjustments as easy as touching a few buttons on the LCD screen. Love my V5 and as yet I am not a quilter but dabbling for the first time with embroidery and having a lot of fun with that as well as my sewing and all the stitches the machine has. The delivery was free to an English address and although I live far away, any questions were answered quickly and now have complete confidence that I have continued support if needed. Would I buy from Lord's sewing again absolutely! !